Games used to be all about pinpoint precision, learning AI loops like the back of your hand and pulling off death-defying skill moves. When I was a younger man I could just about get away with it, but as my reflexes have waned somewhat, things now become a bit of a struggle. It doesn’t help that I’ve been softened by the lovely hand holding games of the last few decades. So here I am playing oOo: Ascension, a game that plays on how lazy my reactions have become, and like an old boxer coming back for one last fight, I have had to draw on all my efforts and skills to be able to cope with this sharp, skill-based puzzler. 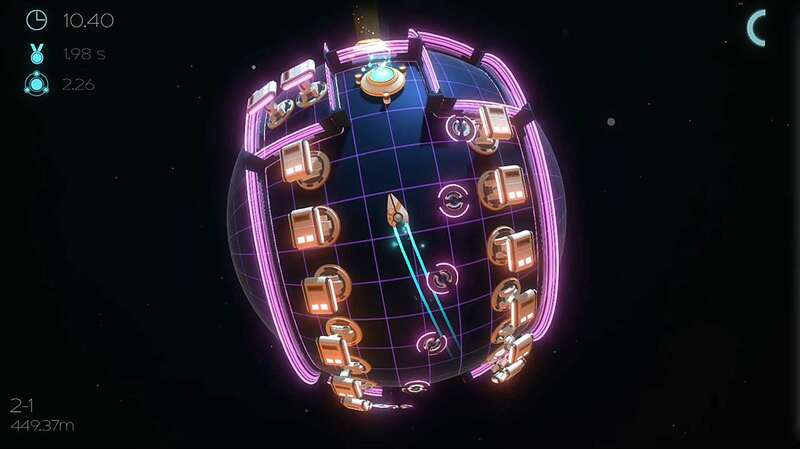 oOo: Ascension, apart from the being the holder of most camp title for a game ever, is a racing action puzzler that provides a short sharp burst of adrenaline gaming – no matter whether that be your heaven or hell. There isn’t a story to speak of, just pure unadulterated high-speed gaming. Each level – at least to begin with – is a short half a minute journey, at least if you’re good enough to get the journey right the first time around. If not, then well, you could be there, like me in the later levels, for days. This makes it a great little game to pick up and smash out before you need to leave for work, allowing you to then pick it up again a week later, with you never feeling like you’ve lost the involvement factor. 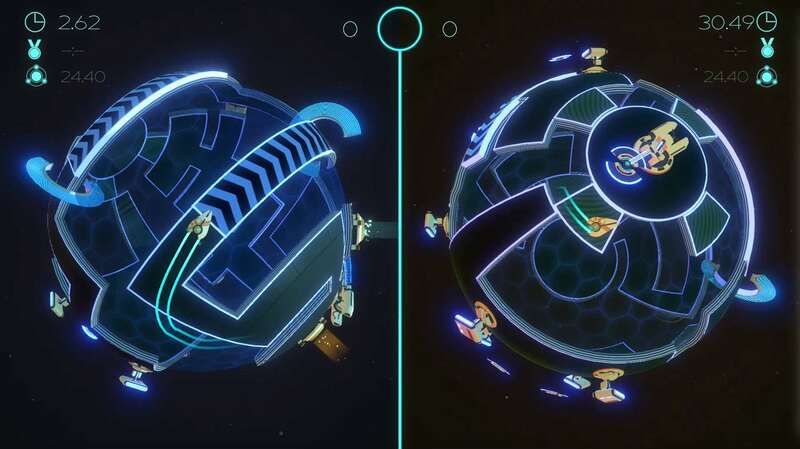 The levels are set on a revolving globe, as you pilot a little spaceship with the objective being to get from one point to another on a short, but epic, journey. In your way are a number of obstacles; moving platforms, rushing enemies, fireballs and all sorts of disasters waiting to happen. You will die a lot, so get used to that straight away, but in between death you will also have to learn all the loops of the globe and work out each level in order for successful progression. You have a boost to give you that extra edge, enabling you to speed away from upcoming obstacles, and some levels will see you needing to boost all the way through, which is both frightening and exhilarating at the same time. For me, oOo: Ascension comes in two distinct halves – the first is full of interesting but challenging levels that you will relish playing. However the other side of the coin sees the difficulty level speed off into the stratosphere, ramping up to leave you seriously frustrated. For the mad and bad gamers out there, there are also target times to hit, but I’m guessing these will only be of interest to those who wish to become some kind of king of this world we like to call Earth. To help you out though, there is the inclusion of a ghost run of the journey you took before you died, and this can be used as a marker to find out what works and what doesn’t. This is a great little device, even though sometimes it confuses more than it helps. In all though, it’s a great little puzzler with a heap of levels to either enjoy or bang your head against a wall with. You’re going to need a lot of patience, nerves of steel and the calm ability to repeat, repeat and repeat, so if you hate the sound of that then I advise you to turn away from this review right now. There is nothing fundamentally wrong with the game though and it can be very enjoyable to play for a while, but it doesn’t take long before it just gets too hard for my brain and that’s where my attention span stops. Would the addition of other modes be helpful? Or an easier difficulty level perhaps? But then I feel like that would really be missing the point of oOo: Ascension. It looks great though, especially the brilliantly clever globe design that is able to feel hugely inventive but melts your brain at the same time. The world has a Wipeout feel to it in the visual department and this isn’t a bad thing as the colour variations are superb, whilst the menu design is clean and concise with the overall timbre being one of futuristic clean lines. There is also an atmospheric future trippy soundtrack that works really well throughout, ramping up the tension and building the drama well. 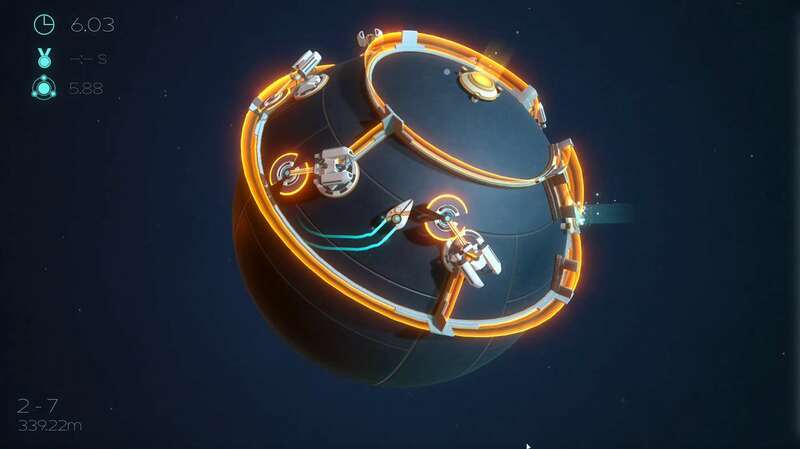 oOo: Ascension is a superb little puzzle game with a really interesting, yet quite unusual, visual design that innovates and frustrates in equal measure. It’s a great game to spend short periods of time with, mostly because the latter half is pretty cruel… but for some nutcases out there it will as easy as taking candy from a baby. I do think the price could have been placed underneath the £10 mark for it to really be worth taking a chance on, but if you’re looking for a mind and finger challenge then oOo: Ascension is calling for you right now.